Geneticist Michael Casler harvests switchgrass seed in a program to develop high-yielding new cultivars that are well suited to bioenergy production in different environments. 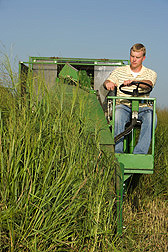 Switchgrass was originally valued as a forage crop, but its more recent claim to fame has been as a potential feedstock for bioenergy production. Now, after decades of combined research, Agricultural Research Service scientists have announced the release of Liberty, a variety of switchgrass specifically developed for bioenergy generation. The release of Liberty is a significant milestone for ARS. It’s also a key accomplishment for CenUSA Bioenergy, a project funded by the U.S. Department of Agriculture’s National Institute for Food and Agriculture that is tasked with developing perennial bioenergy production systems in the Midwest. Other ARS researchers who contributed to Liberty’s development include agronomist Rob Mitchell, molecular biologist Gautam Sarath, and geneticist Michael Casler. Mitchell and Sarath both work at the ARS laboratory in Lincoln, and Casler works at the U.S. Dairy Forage Research Center in Madison, Wisconsin. Casler, Mitchell, and Vogel have all played significant leadership roles in CenUSA Bioenergy. 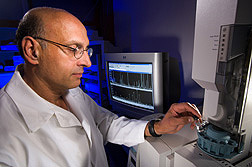 Molecular biologist Gautam Sarath analyzes switchgrass cell-wall samples for their lignin content. The data will be used to identify elite switchgrass plants for improvement through breeding. Liberty made a previous appearance as “KxSNETO2,” one of the switchgrass types used in a 16-year breeding study by Vogel and others to increase long-term yields. In the study, breeding for increased biomass yield in upland switchgrass resulted in average gains of 4 percent every year, while biomass yields in lowland types increased an average of 1 percent every year. However, the lowland-upland hybrid KxSNETO2 increased biomass production as much as 43 percent. Their results convinced the researchers that switchgrass biomass yield is a moderately heritable trait that can be readily improved using conventional breeding methods. However, they did not observe any genetic links between biomass yield and quality. This suggested that breeders might be able to combine different traits to mitigate production challenges posed by climate change, weather, and pests. Another plus with the new cultivar is that gains in yield were achieved without an increase in nitrogen fertilizer use, which helped lower expected farm-gate production costs by around $20 to $30 per ton. And with the increased yields, each hectare of switchgrass could potentially be used to produce from 700 to 1,500 more liters of ethanol. 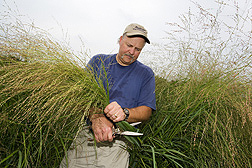 In Nebraska, technician Marty Schmer harvests switchgrass to evaluate yield. The results will help guide breeding and management efforts to increase switchgrass yields. It took a multi-location effort to get to this point. For years, Casler and others have been studying the evolutionary history of switchgrass, which now flourishes in a range of North American environments. Lowland ecotypes are found on flood plains, wetlands, and other low-lying areas, while upland ecotypes are found in flood-free areas subject to frequent droughts. Since switchgrass has successfully adapted to these different environments, its genome contains a diverse array of traits, many of which could be useful in breeding efforts. But switchgrass types can have as many as eight sets of chromosomes in each cell, so natural crossbreeding over thousands of years has produced some varieties that contain an unwieldy genetic mix. To identify evolutionary patterns in the complex genome, Casler and his colleagues examined the genetic makeup of 480 individual plants from 67 lines and cultivars, including upland, lowland, and hybrid types. Using advanced genetic techniques, the team identified several distinct switchgrass “clades” (groups of organisms descended from a common ancestor) in North America. The researchers located two lowland clades in the eastern Gulf Coast and southern Great Plains and three upland clades in the central Great Plains, northern Great Plains, and eastern savanna. The team determined that despite switchgrass’s renown as a prairie dweller, the primary center of origin for modern switchgrass was along the eastern Gulf Coast between 1 and 1.5 million years ago. A less significant center of origin and diversity was located along the western Gulf Coast. Meanwhile, a western mountain ecotype became the source of upland ecotypes that migrated to the arid and semiarid Great Plains, which then became a secondary—not the primary—center of switchgrass diversity. These “crossing cages” are used to make up to 100 switchgrass hybrid crosses per year in the breeding program at Madison, Wisconsin. The scientists surmise that after these types were established, repeated rounds of North American glaciations affected switchgrass dispersal and development by forcing diverse types into relatively close proximity. By increasing the opportunity for different types of switchgrass to mate, the glacial intervals created favorable conditions for much of the gene flow between upland and lowland ecotypes. Conversely, as the plants migrated northward, the opportunities for genetic mixing declined, and upland types adapted to frost and longer days and started flowering earlier. Meanwhile, lowland varieties remained relatively intolerant of cold and continued to flower much later in the summer. Many “hot spots” of genetic diversity still thrive in the southeastern United States and along the Atlantic Seaboard. After sorting through their results, the scientists identified eight regional gene pools with traits that might be beneficial in breeding switchgrass varieties for different production environments. Results from these studies have been published in Genetica and Crop Science. Vogel and Casler also evaluated how previous switchgrass breeding for in vitro dry matter digestibility (IVDMD) altered biomass composition, forage quality, and potential ethanol yield. IVDMD is a laboratory test that mimics the rumen processes of cattle to measure forage digestibility. It is a good indicator of ethanol yield from switchgrass via a process known as “simultaneous saccharification and fermentation,” which researchers hope will become a cost-effective method for extracting and fermenting plant sugars into ethanol. 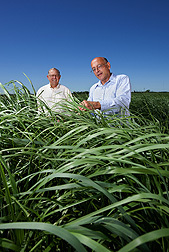 Geneticist Ken Vogel (left) and molecular biologist Gautam Sarath compare switchgrass plants produced by mating plants from upland and lowland ecotypes with parent plants. 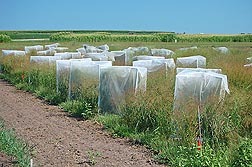 The researchers used six breeding generations of switchgrass in their study. The first four generations had only been bred to improve IVDMD, while the last two generations had been bred to improve winter survival as well. The analysis showed that the six types had notable differences in a range of variables linked to forage quality and ethanol yield traits. The study also showed that forage digestibility is affected by many traits that could be improved with breeding. For instance, breeding solely for increased IVDMD initially lowered forage and biomass yields, but yield levels stayed the same after the scientists began improving the plant’s winter-survival characteristics. And while the first several rounds of breeding increased biomass digestibility and ethanol yields, both characteristics declined in the improved varieties when breeding selection began for winter survival. Researchers often focus on modifying tough cell-wall lignin characteristics to improve the conversion of plant biomass to liquid fuel. However, as a result of their study, the ARS scientists determined that many other cell-wall and cell constituents influence this process. In addition, the scientists demonstrated that breeding to improve IVDMD significantly changed the concentration of almost all the cell-wall components. These changes altered the way carbon was distributed between lignin and carbohydrates throughout the biomass, but did not notably alter total overall biomass carbon concentrations. The researchers were surprised to find that breeding for winter survival in later generations led to decreased IVDMD, which indicated a clear association between the two traits. They believe that selecting for IVDMD might result in plant vascular structural changes that reduce winter survival. The team concluded that breeding to improve IVDMD also affects plant characteristics that are important for ethanol production. The results confirmed that traits affecting biomass composition can also affect plant hardiness—information that plant breeders can use to guide their work in developing switchgrass varieties for forage or for bioenergy. Results from these studies were published in Crop Science in 2013. Mitchell and Sarath, who have been working with Vogel for over a decade, will continue the switchgrass studies at Lincoln and the collaborations with Casler and other ARS scientists. Meanwhile, Vogel is pleased that with the release of Liberty, the plant he began studying so long ago is finally living up to its promise. “It’s nice to retire on a high note,” he says.—By Ann Perry, Agricultural Research Service Information Staff. To contact the scientists mentioned in this story, contact Ann Perry, USDA-ARS Information Staff, 5601 Sunnyside Ave., Beltsville MD 20705-5128; (301) 504-1628. For a plant that can survive the challenges of a prairie environment, switchgrass seeds can be surprisingly delicate. Fewer than 50 percent of switchgrass seeds planted in drilled plots germinate and emerge as seedlings, and more than 90 percent of those seedlings will die within a year. But the competitive environment of the prairie provides a real-world laboratory that fosters development of genetic traits that favor survivorship, such as high rates of root growth or shoot growth. ARS geneticist Michael Casler analyzed 5-year survivorship rates of switchgrass varieties planted at four locations in Illinois and Wisconsin. Although he concluded that most survivorship is random, he determined that survivors at the northernmost location were hardier, with better value for breeding, and their progeny displayed better survivorship and better yields. Results from these studies were published in Crop Science in 2013. "Switchgrass for Ethanol: Where It Came From—and Where It’s Going" was published in the August 2014 issue of Agricultural Research magazine.